Fire is a great threat to forests because it can cause tremendous damage in a short time. Millions of hectares of timber are destroyed annually. Adverse climatic conditions add to the extent and speed at which the fires travel. Not only the forests, but the human habitations and industries based on forest products that are on their fringes are also affected by a forest fire. Even though terrifying, it’s interesting to know more about those wild fires that have taken place all around the World. Following are some of the most devastating forest fires based on the human lives lost and the economic damages caused. This massive wild fire that occurred on October 8 1871, destroying the town of Peshtigo, Wisconsin was the deadliest one in American history. The summer of 1871 was a particularly dry one. There had been other forest fires a month before. Still the forest land was being cleared for farming and railroad construction by setting small fires. On this day strong winds moved in from the west fanning the fires out of control. A firestorm began ie superheated flames of at least 2000 degrees Fahrenheit advanced on winds 110 miles per hour. Peshtigo was a company lumber and sawmill town, home to one of the largest wood products factories in the US then. Every structure was made or wood including a bridge and the roads were covered with saw dust. This would have made it difficult to escape the town during the fire. Some of the survivors had taken refuge in a low marshy piece of ground on the east side of the river. Only two buildings stood after the fire. In Robinsonville on the Door peninsula, a chapel (which has now become the National Shrine Of Our Lady of Good Help),sheltered the nuns, farmers and families who had sought refuge and miraculously escaped in spite of the chapel being surrounded by flames. On this same day The Great Chicago fire occurred, which became more famous eclipsing the greater damage done by the Peshtigo fire. An industrial community, Kursha-2, that made a living from the timber felled in the local forests was established in the lowlands of central Meshchyora, Ryazan Oblast. This was a woodcutters’ settlement with more than 1000 people including women and children. There was a narrow gauge railway train that carried wood to Tumskaya for finishing. On August 1, 1936 a firestorm started south of Kursha-2 and extended north growing fast in intensity. The tragedy unfolded on August 2. An empty train arrived at Kursha-2 and its crew offered to evacuate the women and children. But a decision to send wood instead prevailed. As the train was being loaded the firestorm reached the settlement. Those who tried to escape sat on the carriage couplings, the steam engine and on the logs. There wasn’t enough space and many were left behind. The train reached a connecting bridge to the north and found it was already ablaze. There was no escape for the train with its passengers. 1200 people died that day in the firestorm. The only reminder of this event is a mass grave near the ruins of the railway depot. A combination of drought conditions, high winds and a lack of fire fighting equipment make it difficult to contain a wild fire. Carlton County in Minnesota had a thriving logging industry during the early 1900s. The railroad was an important part of this industry. The cleared forests were occupied by farmers. With increasing population, the economy also flourished. On October 10 1918, a fire was ignited by sparks from railroad tracks as a passenger train passed through and began burning through grass and piles of wood. The fire could not be contained and by October 12 high winds had fanned the flames and sent them roaring through the forests and lumber mills of Northern Minnesota. Though the National Guard was called in for relief operations, they could not extinguish the fires. They then began to help the survivors. Much of western Carlton county was affected especially Moose Lake, Cloquet and Kettle River.453 people died and 52000 people were displaced. 250000 acres were burned which included forest land and human settlements. The fire burnt 350000 acres of land and claimed the lives of 418 people. Livestock and wildlife were also lost on a large scale. The years from 1891-94 were dry. In the summer of 1894 fires had been burning frequently. A haze was present almost continually accompanied with a smell of smoke everywhere. The town of Hinckley, the settlements of Mission Creek, Brook Park, Sandstone, Miller, Partridge and Pokegama were destroyed. People climbed into wells, hid in 18 inches of water and mud of Skunk Lake, took refuge in gravel pits. The total death toll was probably higher than the official estimate because of the unknown number of Native Americans and back country dwellers whose bodies continued to be found years later. The total losses were counted 3-5 $million not including the huge loss of the forest resource. On September 5 1881, The Great Thumb Fire burnt over million acres in less than a day, killed 282 people in Sanilac, Lapeer, Tuscola and Huron counties. It was a consequence of drought, hurricane force winds, heat and ecological damage due to indiscriminate deforestation. There was so much soot and ash in the atmosphere that many locations on the East Coast of the US had less sunlight. In New England cities the sky appeared yellow so did the buildings and vegetation. The fire burnt till September 7. The Red Cross’s first official disaster relief operation was in relation to the Thumb Fire. Several small fires that were purposely set by settlers to clear the land, merged on July 29 1916 into a single large firestorm. It passed through the communities of Black River- Matheson and Iroquois falls in Ontario. The fire burned an area of 490000 acres. 233 people died. Many others escaped on the railways cars and others by wading into the Black river and the other lakes in the area. These 1997 fires of Indonesia burnt well into 1998 as well. These fires began affecting the neighbouring countries of Malaysia and Singapore by spreading thick clouds of smoke and haze. By 1998 Brunei, Thailand, Vietnam and the Philippines were affected to a lesser extent. 8 million hectares of land had burned and millions of people were affected by the air pollution. The cause of these fires was mainly the slash and burn technique used by the farmers to clear the land for traditional agriculture. The extensive amount of biomass and long fallow rotation of jungle rubber is also cleared using fire. When fire reaches highly flammable peat swamps, it becomes very difficult to control. In addition to this the El Nino, a weather phenomenon associated with increased atmospheric temperature and winds was also present. The estimated value of damages is $ 4.47 billion. The damages that are not easy to measure are loss to human life, long term health impacts and biodiversity losses. This was a major wildfire that occurred in China and the Soviet Union during May 1987. 18 million acres of forest land was destroyed. More than 200 people died and many more injured. Chinese reports say that the fire began ‘when an untrained 18 year old worker accidentally ignited gas spilled from his brush cutter’. The Da Hinggan forests in the Greater Khingan mountain range in north eastern China were affected by drought. Parched vegetation and high winds fuelled the firestorm. 33000 Chinese became homeless. The Chinese and the Russians responded differently to the fires. Because the Chinese saw the forests as a valuable resource they spent much effort to combat the fire. They lost 3 million acres of forest land. The Soviets felt their vast timber reserves would not be seriously affected and so allowed the fire to burn out on its own. They lost 15 million acres of forests. The impact that governments can have on the environment is a valuable lesson learnt from this fire. This also helped improve response to wildfires throughout the world. 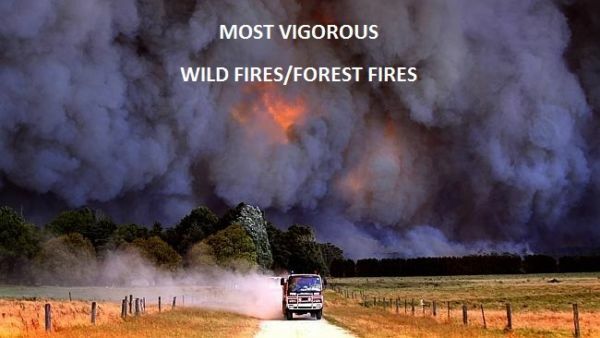 A series of bushfires burned across the Australian state of Victoria on February 7 2009. 173 people died and 414 were injured. 400 individual fires were recorded. Urban and rural fringe areas; farmland and forest reserves were affected. Total of 450000 hectares of land was affected. The state was experiencing a severe heat wave and there was a total fire ban declared for the entire state. The first fire was triggered by a single wire earth return electric line that was rigged incorrectly and was ripped down. Many fires sprang up because of the fire conditions. The last fires were extinguished by March 4. Unfortunately wild fires are not always controllable. Global warming and changing climates are also contributing to this natural hazard. The efforts of fire-fighters and the risks taken by the trained personnel to contain a raging fire are to be appreciated. Another important aspect to consider is the increase in air pollution caused by even natural fires. Lessons for the future are learnt from these horrific natural disasters. This is purely based on the data available till 2017.